Well, we all understand what we mean by the term, right? Of course, as usual there may be a number of variations within the genre, but essentially ‘stoner’ defines bands who are heavily influenced by classic hard rock names from the 1970s – Black Sabbath, Blue Cheer, Neil Young, Grand Funk – all routed through a love of Cheech & Chong’s ‘up-in-smoke’ lifestyle, and an appreciation for the space rock of Hawkwind. Get the idea? The doyens of stoner rock are Masters Of Reality, Kyuss, Fu Manchu and Monster Magnet – the bands from which so many strands have grown over the past 15 years. Theose are the bands that came rushing headlong with their deep grooves and riffs, puffed up by a blood-rush of progressive ideas. However, it was Queens Of The Stone Age who rolled all of this up into a consistently more commercially acceptable and successful concoction, sharpening up songs to make them appetising to a wider audience than stoner previously appealed to. What this movement – such as it was – also did was encourage musicians to test their limits, and work with each other in a fluid situation. It didn’t matter what band you were supposedly with, why not jam with others? That has been the basis for QOTSA principle Josh Homme’s Desert Sessions series, which has even persuaded talents like PJ Harvey to get involved. Today, the stoner movement is more diverse than ever, but it has remained steadfastly underground. The chart success of Monster Magnet and QOTSA has done little to persuade either the bands or the major labels to trust one another. And yet its importance has never been greater. And let’s not forget: when most people decried the 1970s, the stoner bands were actively defending its meaning. Reason enough to hail this as a vital genre. So many of today’s stoner giants – Josh Homme, Nick Oliveri and Brant Bjork among them – started out in Kyuss that it’s easy to see this Palm Desert band as, more than anything else, a conduit for later triumphs. But Blues For The Red Sun is a work of genius, and one upon which much was to be based during the 1990s. Distortion, nu metal, grunge… it’s all here, through songs like Green Machine, Molten Universe and Thong Song. Without realising it, Kyuss clearly defined a brave new world. And let’s not forget that Masters Of Reality mainman Chris Goss played his role in Blues For The Red Sun, having produced this masterpiece. For the most part, stoner rock is seen as the province of the more weed-friendly US west coast. New Jersey’s Monster Magnet had their own, more diesel-fuelled approach, and Powertrip was the first record to prove that stoner music could sell – in its millions. Dave Wyndorf and co. didn’t so much tone down their excessive jam-led style as allow it freedom within defined songs. Crop Circle, Space Lord and Goliath And The Vampires are brilliant examples of how to create a sense of adventure. Some may prefer the band’s earlier, more experimental albums, but Powertrip is more exhaustive. Who’s the most important figure in the stoner genre? While some may claim it to be Josh Homme or Dave Wyndorf, most would accept that Chris Goss owns that that title – lock, stock and spliff. The Masters Of Reality leader has worked as producer and songwriter with so many in his area of music, but arguably his biggest contribution was this kick-against-the-norm self-titled debut from a band who perennially under-achieved, but set the whole ball in a timeless motion. John Brown, The Blue Garden and Domino are fundamental in what was to come later. The dark heart given life. So, here’s the scene: Sleep are snapped up by London Records, and everyone holds their breath to see how this bunch of ne’r-dowells from North Carolina will adapt their Trouble and Sabbath influences to fit in with major label demands. So what do the band do? A 52-minute, ultramonochrome album that has just one track – arguably the greatest of all rock’n’roll swindles. The result was that the band, having gone way over budget, were hastily dropped; the album became a cause celebre, and is finally released more than a year after it was completed. The ultimate expression of artistic insouciance, and of taking the piss, Jerusalem is where doom meets stoner. Having had considerable fun on 1998’s self-titled record, on Rated R Queens Of The Stone Age honed their more elusive, dense ideas and went for an approach that, on the surface, seemed very chart-friendly. However, anyone who believes that Queens had lost their edge ought to go back and give this another shot. Feel Good Hit Of The Summer is not just hilarious, but shows up the hypocrisy in banning certain records because of ‘naughty’ words. The lyrics are just a list of, mainly, banned drugs. The whole tone of the record is absurdly irreverent, but QOTSA were cunning enough to turn the system against itself. Britain doesn’t have much of a stoner tradition. However, Orange Goblin are not just the best in the country, they’re also genuinely world-class. While they’re still a cult band, this album proved they could trade blows with any of their American or European cousins. The blues-metal guitar explosions of Joe Hoare led the way on a succession of outrageously inspired tracks, including a cover of ZZ Top’s Just Got Paid. Their own songs – especially Black Egg and One Room, One Axe, One Outcome – were equally outrageous blasts through dirtied-up, hard rock battlefields. Their time will surely come. One of those bands who are always regarded as prime movers in stoner music, Fu Manchu have never really delivered a classic record. This one, though, came close. 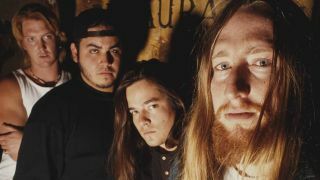 With guitarist Eddie Glass and drummer Ruben Romano making their farewells, before quitting to start Nebula, the band actually had a decisive edge on songs like Asphalt Risin and Seahag. Fu Manchu regularly flattered only to deceive. Here they conquered a predilection for over-indulgence, and in the process avoided the lack of focus that undermined what could be achieved. The band never again got this close to achieving their potential. The former Kyuss and Fu Manchu man has always been a compelling live performer, happy to use songs as the basis for outrageous jam sessions. But on record he has rarely got in spitting distance of matching the charisma he has on stage. Saved By Magic, though, did see him adapting the purpose of his live set; he didn’t so much attempt to emulate this in the studio, as accept that different tools were necessary. The result was precision, without loss of any underlying spontaneity. Saved By Magic is still not a patch on seeing the band playing live, but at least it offered a hint of that power. For a while this was the Californian band that everyone expected would follow Queens Of The Stone Age and Monster Magnet into the big league. It never happened for a variety of reasons, not least because the trio seemed to go rather stale. Apollo got guitarist/vocalist Eddie Glass and drummer Ruben Romano back on the plate. Marking the debut of English bassist Tom Davies, it was easily the band’s most consistent recording, and producer Daniel Rey managed to remedy the lacklustre studio performances of earlier albums. It may be too late for chart success — the band have been on hiatus since 2010 — but Apollo put Nebula back in the saddle. With a line-up that pulled members from Pantera, Corrosion of Conformity, Eyehategod and Crowbar, Down didn’t so much as announce themselves to the world as seep into existence, releasing a three-track demo without telling people who the musicians involved were. An obvious labour of love, the debut album that followed was in thrall to its influences — Sabbath, St Vitus, Skynyrd etc. — yet somehow greater than the sum of its parts. An instant classic, highlights include the sludgy weed tribute Hail The Leaf, the swaggering Temptation’s Wings, and the climactic closer Bury Me In Smoke.